Growing your own coffee at home is actually a lot easier than you’d think! In this gardening tutorial, we will show you how to grow coffee plants in pots so that eventually, you can enjoy the freshest of coffees right at home! For this gardening tutorial, you’ll learn how to grow the Arabica coffee plant as it has one of the most aromatic beans you’ll ever come across! This plant can also be grown ornamentally, as it’s a beautiful plant with glossy leaves and a truly aromatic smell! Climate: The Arabica coffee plant can be grown in USDA zones 10-11, as well as 7-9, as long as they are taken care of during winter months. Propagation Method: Seeds, vegetative propagation. Soil Type: Acidic to slightly acidic. The coffee plant reaches about 5 meters in height, but grown in containers, it can easily be pruned to a shorter height as to save space. The leaves are dark green, slightly ribbed, and very shiny, so it makes an excellent decorative plant as well! In its native climate (tropical and subtropical), the coffee plant will bloom twice a year. In a homegrown environment, the plant will bloom twice – usually in the spring and summer. Small, delicate white flowers, such as those of Jasmine, will appear. The plant will then bear small fruits that will start off green in color and then change to red. Find fresh green seeds at your local nursery (rare), or purchase them online (best option!). Sow seeds in spring to mid-summer. Once temperatures reach at least 20C, plant the seeds in moist, slightly acidic soil. Be patient as seeds will take a long time to germinate, usually between 1 to 6 months. After germination, keep the plant in partial shade, receiving only morning sun. Transfer your young plant to a deep pot with good drainage hole. Keep in a warm and humid spot, but away from direct, afternoon sun. Soil should be kept humid at all times, so regular watering is absolutely necessary, since this plant is native to rainforests. Keep out of direct sunlight, and only give your plant morning sun. Fertilize once a month after your plant has germinated. Use a fertilizer that is used for citrus plants. Once a year, apply an iron fertilizer, as acid-loving plants can sometimes suffer from iron deficiency. Prune your coffee plant once it reaches a height of 2 feet. Prune the growing tip to encourage side branching. Keep your coffee plant indoors during the winter months. Your coffee plant will take 4-5 years to start fruiting. The harvesting process can be tedious, but definitely worth it! All in all, the coffee plant released a beautiful smell and looks great as a decorative plant! 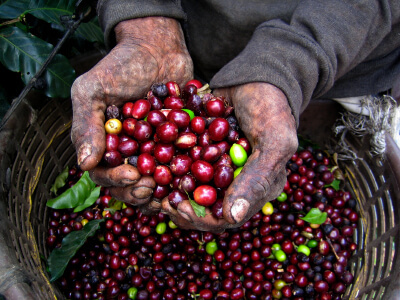 So now that you know how to grow coffee plants, it’s time to roll up your sleeves and get to planting! 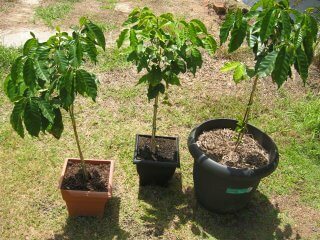 How to Grow Coffee Plants In Pots was last modified: January 4th, 2018 by Aniela M.